Today is the first Marriage Monday of the new year and I am happy to be a participant once again. Apparently, our lovely hostess, e-Mom over at Chrysalis, wants us to begin the new year with a smile, so she has asked to write about the humor in Christian Marriage. Building and maintaining a strong marriage is hard work, but God wants couples to enjoy the time they spend creating a Godly marriage. One way our Heavenly Father helps keep our marriage and many others pleasant is by allowing us to experience a hearty dose of laughter every now and then. A few months ago, JT and I enjoyed a good laugh over something most unusual: a pink tutu. My friend Monica and I have girls the same age and over the past few years, we have swapped books, toys, and clothes for our girls. In the fall, Monica’s daughter, Cutie Pie, took a dance class. After dance class ended, Monica enrolled Cutie Pie in an art class, while I enrolled my older daughter, Sweet Pea in dance class. 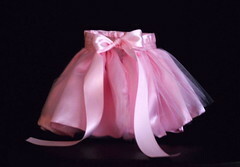 Since Cutie Pie was no longer using her pink dance tutu, Monica gave it to me so Sweet Pea could wear it during her upcoming dance classes. Before leaving Monica’s house, she placed the pretty pink tutu in a pink striped shopping bag and gave it to me. I neglected to bring the bag into the house so it remained in our minivan for a few days. Later that week, JT cleaned out the minivan, discovered the pink bag, and happily strolled into the kitchen holding the bag, and wearing a wide smile. I was standing at the stove cooking dinner when JT said to me, “I see you’ve been shopping for something pretty, pink, and frilly!” I put down my spatula and turned around in time to see JT happily hoist the pink Victoria’s Secret bag. I immediately laughed as pink fabric and toile peeked out from the bag my husband was holding. Lord knows, I wish I’d had a camera to snap a photo of JT’s face when I broke the news to him! We both had a good, long laugh (though I admit laughed a tiny bit longer than JT) over that pink tutu. JT, who is a great sport, remarked that Monica needs to use regular plastic shopping bags when giving things to his wife! Hmmm, Valentine’s Day is right around the corner. I wonder if my gift will include something pretty, pink, and frilly! For other humorous anecdotes about Christian marriage and an interesting wedding video, visit e-Mom over at Chrysalis. Oh that is too funny Andrea. You and your husband are too cute. This was just the cutest story!! You write so well. I could just visualize everything like you shared it. Now, I’ll look forward to hearing “all about” your Valentine’s gift! Thank God for laughter and all the joy it brings. You always offer the greatest topics! Thanks for stopping by! Laughter is good for us! Thanks for stopping by and sharing a giggle! I enjoyed the wedding clip at your blog! Thanks BJ! This was quite the funny moment! okay this brought tears to my eyes.. too too funny! sounds like something that would happen here too! thanks for being so candid! Great story! I can imagine the look of disappointment on his face, because it would have been the same as my husband would have had if he thought VS was in the house. Bless you for sharing. What a cute story. Thanks for sharing it. Your blog brightened my morning per usual! Miriam, a photo of JT’s expression would have been PRICELESS! Oh well! Thank you for visiting me! Kathy, it’s good to see you again! I’m happy I could make you smile! Marriage is full of funny moments. Thanks for taking time to read about one of ours!